It’s Tuesday morning…I feel like I should have done something…What is it?!?! Oh! Yeah!! Tuesday Ten!! The funny part is that I actually had planned on writing this one ahead of time. I honestly didn’t procrastinate, I just got really productive with other things. I cleaned off my desk at work, did a ton of laundry at home and basically wore myself out doing things other than writing. Procrastination. I tend to put things off until right before they are due. I enjoy being caught up on things. Heck, I’ve even been ahead a few times. I just can’t seem to stay there! “While you’re up” I play this game from my Sheldon-like corner of the couch. “Honey, while you’re up, can you get me some more water?” “Frances, while you’re up can you tie your brother’s shoe.” I get annoyed at myself every time I hear it. I really need to get up and take care of myself. Picking at my finger nails. I used to chew on my nails. They never grew past the ends of my fingers. I managed to stop that habit and now they grew quite nicely. I still can’t show them off though, because now I pick at the skin around my nails. It’s worse in the winter when my skin is dry. Miscalculating my time. I’m not sure this is a bad habit, or just an underdeveloped life skill, but I have no concept of time. When I run errands, I often tell Ken “It shouldn’t take that long. I’ll be back in an hour.” Of course it never takes an hour. Usually twice that. I’m always getting back much later than he and I anticipated. Thankfully he knows me well enough that he just doubles the estimate I give him, so he’s better prepared. Being late for things. This is related to the above habit. I often fail to calculate driving distances well, or I forget how long it actually takes everyone to find their shoes. Plus, I really hate being early. I know that sounds stupid, but when I’m early and I’ve got three kids in tow, I’ve got to figure out how to entertain them and keep them out of trouble before whatever event occurs. We usually use up our store of “keeping it together-ness” before the event even starts if we’re early. Distraction. I’m currently writing this post in a Word document. I knew if I tried to write it in my web editor, I’d just click over to Facebook and then the news, and then a really funny Buzzfeed article and then…oh crap! Yeah, I get distracted a lot. Squirrel! •	Misplacing my keys. I’ve been better lately. They are usually in my purse. Or my coat pocket. Sometimes even on the nice key holder by the front door that Ken made me so I’d stop losing my keys. Internetting. What a rabbit hole!! I get so lost checking “one more thing” on my phone. I’m working on it. Especially after I see my kids starting to do the same thing. One un-named child has been having trouble getting ready for school because a game app keeps ACCIDENTALLY opening on the phone in the morning!! Collecting things. This is one I’ve also been getting better about. Just last week, we got a delivery at work and the items came in nice little hinged cardboard boxes. “Those would be perfect for storing things in!” someone said. And there were even three of them. One for each child. I set them on the shelf behind my desk and contemplated taking them home, and then…I DIDN’T! It’s still an urge I have to fight against though. Saying “yes.” I like to be helpful. I like to be involved with things. I currently have a husband, three kids, a cat, a full-time job, a part-time (blogging) job, I sit on the board of a local non-profit and I participate in a very active committee on that board. I teach Sunday school. I serve on a committee at the boys’ school. The kids are in soccer, dance, and violin. Some weeks there are no nights to just go home and chill. I enjoy it while we’re involved, but then when an activity ends (like soccer just did) it’s a big relief to have a night back! 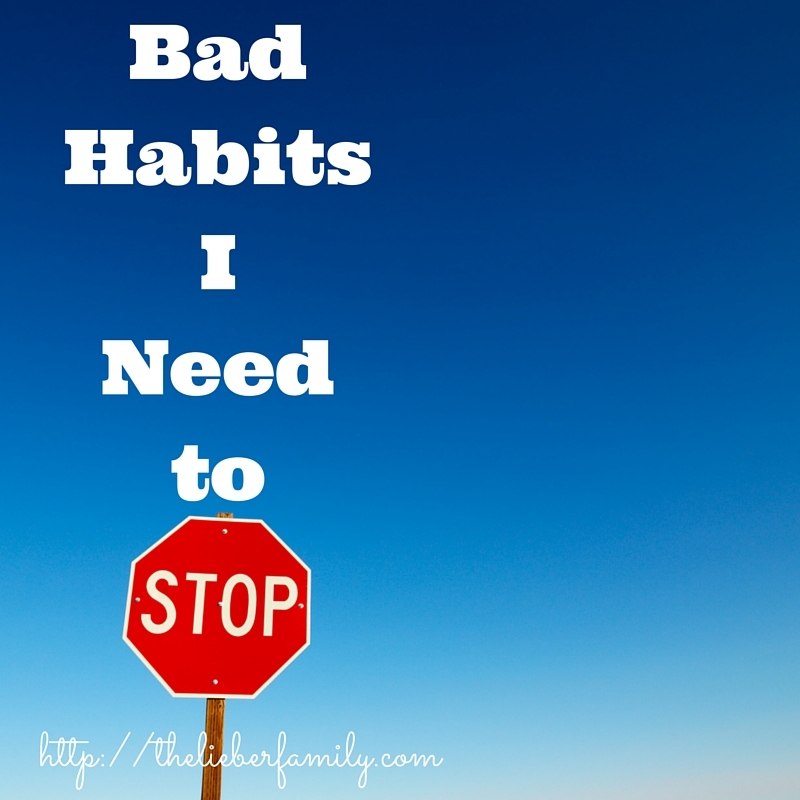 What bad habits do you need to kick to the curb?